The University of Minnesota Twin Cities (Minnesota; locally known as the U of M or simply the U) is a public research university located in Minneapolis and St. Paul, Minnesota. The Minneapolis and St. Paul campuses are approximately 3 miles (4.8 km) apart, and the Saint Paul campus is actually in neighboring Falcon Heights. 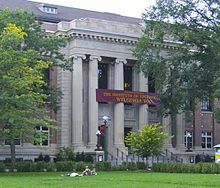 It is the oldest and largest campus within the University of Minnesota system and has the sixth-largest main campus student body in the United States, with 51,147 students in 2013-14. The university is organized into 19 colleges and schools, and it has sister campuses in Crookston, Duluth, Morris, and Rochester. UMN is categorized as an R1 Doctoral University with the (highest research activity) in the Carnegie Classification of Institutions of Higher Education. Minnesota's athletic teams at the Twin Cities campus are known as the Minnesota Golden Gophers and compete in the NCAA's Division I as members of the Big Ten Conference. They have won a total of 20 national championships as of 2015. The Knoll area, the oldest part of the University's current location, is located in the northwestern part of the campus. Most disciplines in this area relate to the humanities. Burton Hall is home to the College of Education and Human Development. Many buildings in this area are well over 100 years old; a 13-building group comprises the Old Campus Historic District that is on the U.S. National Register of Historic Places. A residence hall, Sanford Hall, and a student-apartment complex, Roy Wilkins Hall, are located in this area. The Institute for Advanced Study is located in the Nolte Center. This area is located just south of the Dinkytown neighborhood and business area. What are the academic rankings for University of Minnesota-Twin Cities? 1. number 30 for Academics. What universities are similar to University of Minnesota-Twin Cities?